Solar cook just about anywhere ! It's fun to find out where the sun is being used to solar cook food! When someone burns less wood, this slows deforestation, erosion and thus the growth of the deserts. The time freed up from not having to gather fuel is now better spent in education. Less smoke to inhale improves one's health. Solar sanitized water that doesn't even have to come to a boil, saves young lives and helps to ensure survival after a natural disaster occurs. All of this is heavy, important stuff ! My commendations to the heavy lifters performing this work. Read about my favorite non-profit. For me, using solar energy is about all of these things, but mainly it's about the food and the armchair traveling to the solar hotspots around the world that I become aware of. I dream of actually traveling to some of these places where a solar stove can change a life. For brevity, I'll mention only the places where our cooker has sold. I have informed my Mother that she is famous somewhere in Turkey for her role in our rice video. My web stats tell me that curious fact. I'd love to visit there! I hear from returning visitors that the Turkish people are a treasure. They treat Americans well and ... I do love their cuisine. Yummm! I need to mention Israel in the next breath, for contrast. These Israeli guys are sharp. Anything to ensure survival gets noticed. Taking advantage of their abundant sunshine to cook insures their quality of living. They are a tad high strung, but great to work with! You'll find our cookers near Oaxaca, Mexico and in Panama, Hawaii and Micronesia. Surprisingly, you'll find a couple in England ! That's like Seattle for sunshine (not good), even worse for their last few summers. But still "mad dogs and Englishmen...". 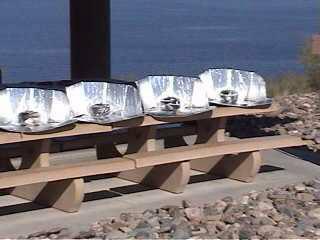 There are HUNDREDS of solar cookers in Calgary, Alberta ! Much farther North than Seattle and with even a shorter cooking season. Yet, these Canadians have worked their cookers to make dishes that I have had trouble with here. They even have big solar cook offs. I need to journey there to learn a thing or two. Hats off to ya ! In the U.S., the obvious places are in the Western States- Utah, Arizona, California, Montana, Idaho. Surprisingly few in Texas (I think they are slow learners) or Colorado. Kansas has been good. So has Tennessee, Pennsylvania and Ohio. Florida is slowly , but steadily cooking more with the sun. Even Georgia has been. One place in Florida I want to go to has cooking with the sun down right, in my opinion. Vacation on the beach. Cook while you play ! See their Dining page. It has enriched my life promoting and watching the spread of something so easy and tasty as cooking one's meals slowly in the sun. So, to all of my customers, past and future, THANK YOU ! Our world is a tiny bit better place because of you. Thanks again and Shine On !